Video Highlights of the 2018 New Moon! Who can participate? You! We encourage runners and walkers of all shapes, sizes and abilities to participate. The course is open and fully supported for three and a half hours. Walker must be able to walk at an approximately 15:30 pace to complete the half marathon. Heritage Series Medal - Custom "official" New Moon finishers Medal for the Half, Quarter & 5K. Separate medal for the 5K. First beer, wine, coffee, or espresso on us! 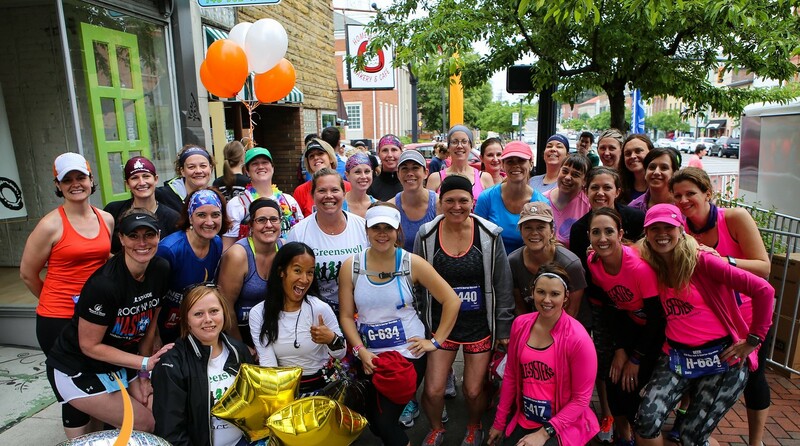 The New Moon Half & Quarter Marathon, Crescent Moon 5K offers runners and walkers looking for a race that is reminiscent of running in your hometown. Located in Delaware, Ohio the city is the perfect mix of urban amenities and rural Midwestern charm. Start and Finish are located in the historic downtown Delaware, featuring a number of craft breweries, local family-owned restaurants and sidewalk cafes, antique stores, arts and crafts, bookstores, historical cinema, and other retailers. 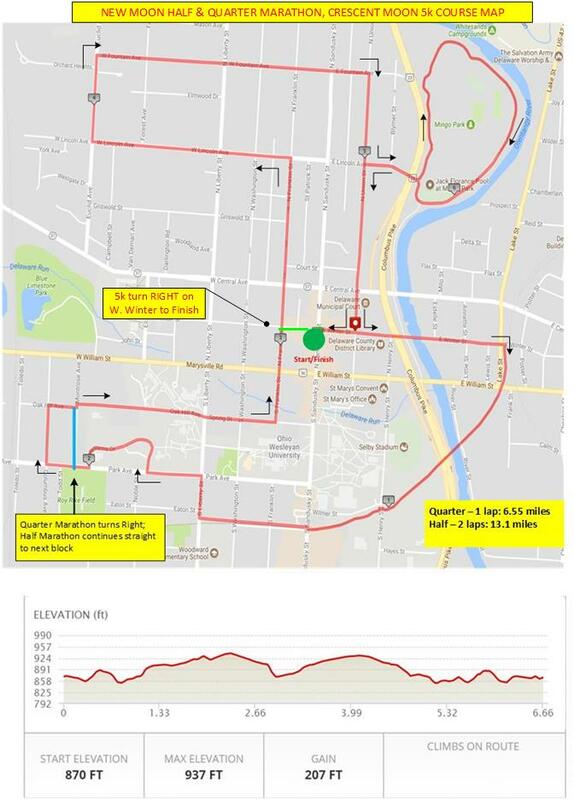 The 6.55 mile course truly features a tour of Delaware, Ohio. 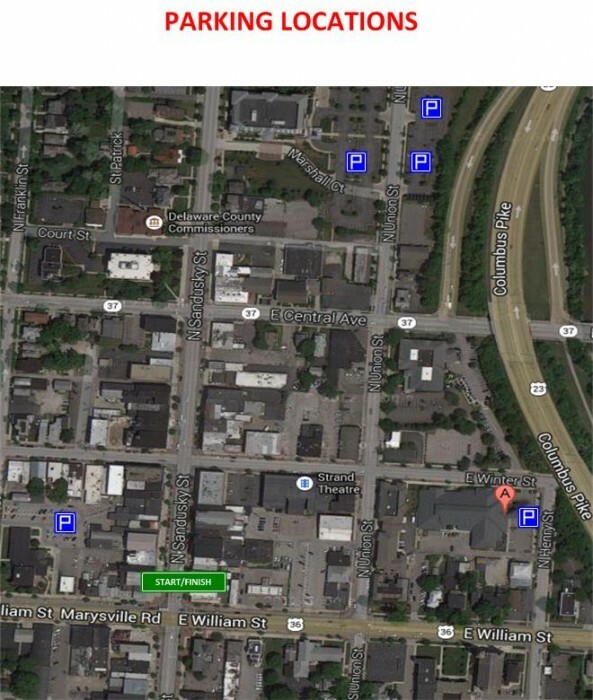 The course winds through the City, through tree-lined historic neighborhoods, through the campus of Ohio Wesleyan University, along side the Olentangy River in scenic Mingo Park, and back to downtown Delaware. Half marathon athletes will complete two loops of the course providing them an opportunity to run the course again to the cheers of residents and spectators. The event has a special open container license so family members can purchase their favorite brew or wine from a local establishment, come outside and watch you at certain spots along the course and enjoy their favorite adult beverage. 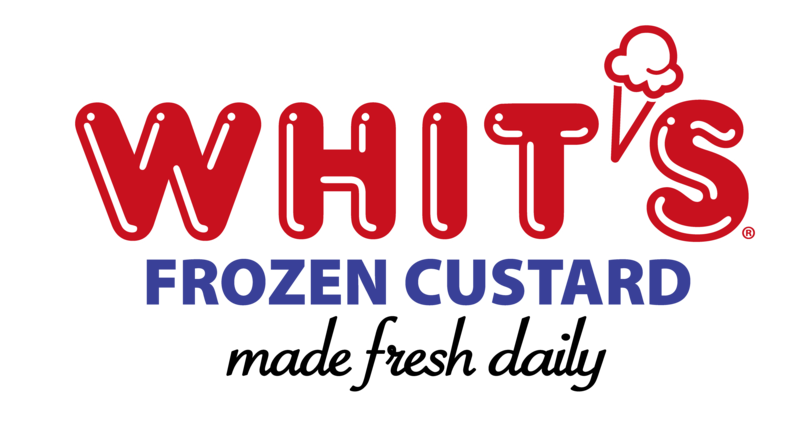 All participants will get a FREE serving of the famous Whit's Frozen Custard at this year's New Moon Half & Quarter Marathon, Crescent Moon 5K Celebration! After you finish your run or walk, you will be able to enjoy a serving of frozen custard to cap off your evening! 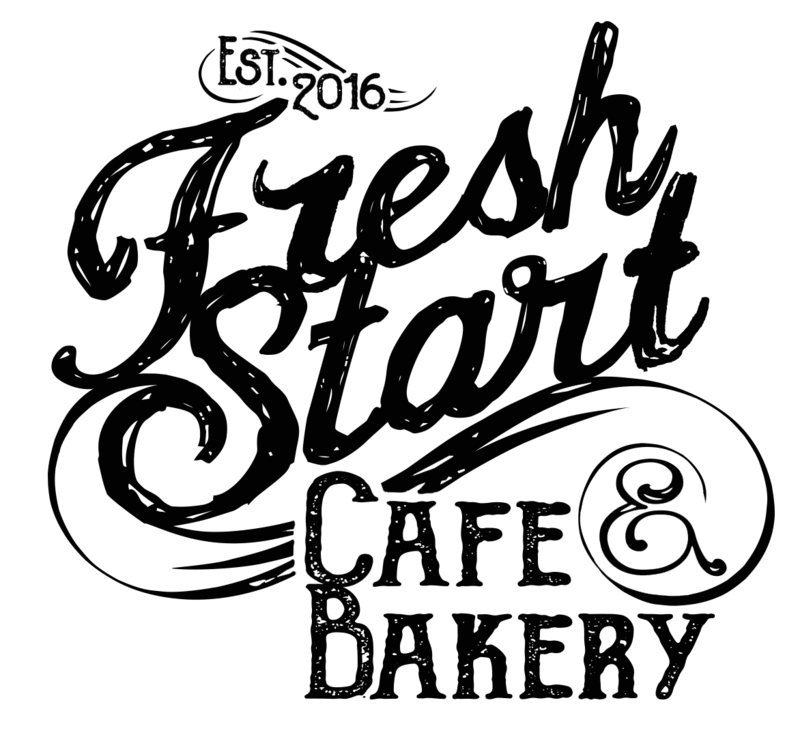 If an alcoholic beverage is not your preference, then we have some additional choices for you - you have a choice of a 16 oz Cold Brew Coffee, Iced Flavor Latte, Iced Chai Latte or Organic Iced Tea courtesy of Fresh Start Cafe & Bakery! COURSE: 6.55 mile loop, ideal for spectators to cheer (5K is same course but turns at approx Mile 3 at W. Winter to Finish). The 3.1 mile course the same course as the main 6.55 course; however, athletes will turn at approximately the Mile 3 mark on W. Winter to head to the Sandusky St Finish. All finishers will receive a custom New Moon Medal. Finishers will be able to enjoy the 1st glass of the summer drink of their choice in the New Moon Celebration Block Party. Greenswell LiveTracking in action! 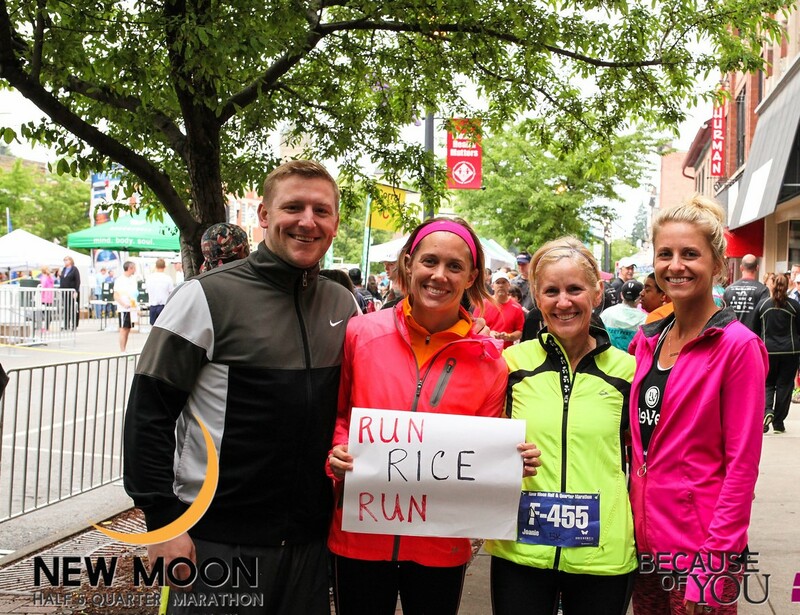 Engage your family and friends to follow you live during this year's New Moon Half & Quarter Marathon, Crescent Moon 5K! We have introduced Greenswell LiveTracking to this year's event which will allow friends and family to track your real-time activities and progress during the race! With the Greenswell EventApp all athletes can be tracked real-time. Download the event app, watch as your friends and family members start the race, track their progress, enjoy the experience and we will do the rest. Note: If you registered for the half marathon and started in the half marathon but then decided to complete only the quarter distance, you are not eligible for an award placement. All award winners must start and finish in the distance they registered and started the race. Welcome to the New Moon DORA! The City of Delaware has launched the Downtown Outdoor Refreshment Area (DORA) in portion of downtown Delaware historic district. New Moon Half & Quarter Marathon, Crescent Moon 5K will be an official DORA event! What does this mean for New Moon participants, spectators and Celebration attendees? The DORA allows you and your friends to obtain from one of participating restaurants, pubs, and entertainment venue to carry up to 16 oz of an open alcoholic beverage in a designated cup outdoors! Don’t worry – your first BEER and WINE is still on us but NOW you can have multiple choices - from a locally-crafted micro-brews to your favorite IPA, from Pinot Grigio to Delaware urban craft wines. Where do I get my 1st Beer or Wine at the event? Delaware has one Outdoor Refreshment Area – and the New Moon Celebration Area is right in the center of it! 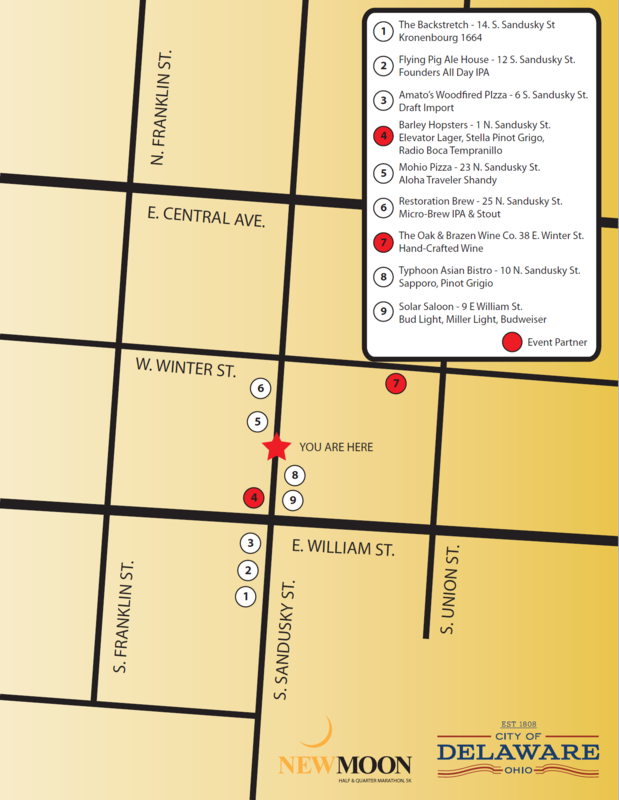 Below is a map highlighting the establishments partnering with us where you can get your choice of drink. Positioned outside of each establishment there will be a large RED Feather Banner indicating where you can get your first drink on us! Each establishment is offering a different drink including wine. Most establishments have a sidewalk patio where you will be able to easily get your drink versus having to go inside. There are other establishments participating in the DORA but if they don’t have the RED feather banner you will have to purchase your drink. How do I get my 1st Beer or Wine at the event? Attached to your bib for participants of age is your drink ticket. These are to be redeemed at the establishments indicated on the map and by a Red feather banner. No ticket = No free drink. Any drink after your 1st one or no ticket you will need to pay for your drink. PLEASE BRING A DRIVERS LICENSE or STATE ISSUED ID. Establishments will be requesting IDs to avoid giving anyone not of legal age a drink. 3. Can I buy a drink ticket? No. There will be no drink tickets sold at event. 4. Can I walk anywhere with my DORA cup? No, you must stay within the DORA boundaries. Leaving the DORA with an alcoholic beverage breaks State of Ohio and City of Delaware open containers laws. 5. Can I take my DORA cup back inside the establishment in which it was purchased? No, once a DORA cup has left a business, it must be consumed before you enter any establishment other than a residence. This includes reentering the business in which it was purchased or entering a new business. 6. Can I take an empty DORA cup into a business so I can reuse it? No, you must throw away a DORA cup before entering any business. 7. What types of alcoholic beverage can I have in my DORA cup? Beer and wine are all allowable drinks in DORA cups. Drinks must be purchased from a participating business. 8. Can I bring my own alcoholic beverage, pour it into a DORA cup, and walk around in the DORA? No, only drinks purchased from businesses participating in the DORA are allowed. No cans, glass bottles, or outside drinks are permitted within the boundaries. Note: All State of Ohio and City of Delaware laws regarding public intoxication, impaired driving, and open containers apply to areas both inside and outside of the DORA boundaries. Please drink responsibly. There are no refunds for this event, No refunds are given for injury, pregnancy, or any other medical conditions.